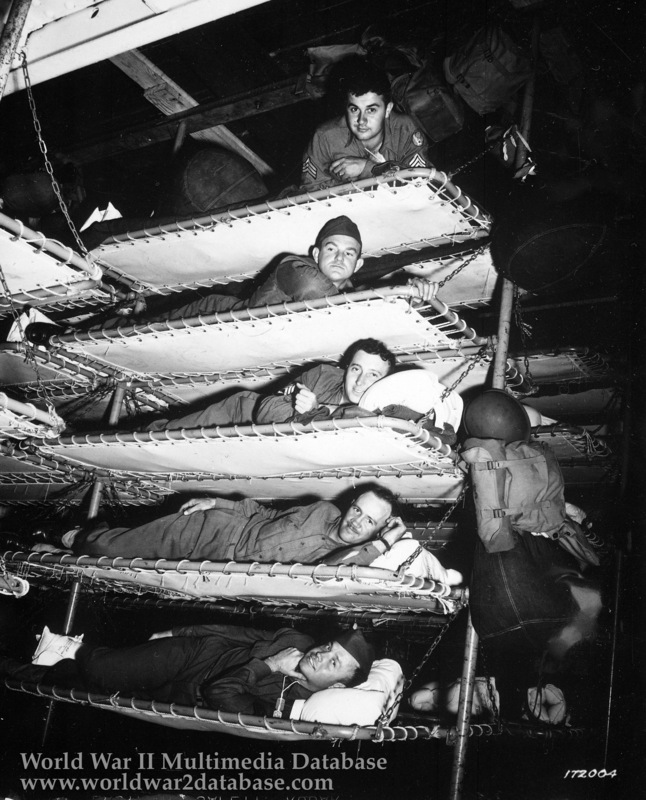 Soldiers in bunks on Army transport, S.S. Pennant, Port of Embarkation, San Francisco, California. The Steamship Pennant was a Danish ship seized by the United States after the declaration of war by Germany. The American government appealed to Danish seamen to stay at their posts when the ships were taken over by the United States. She was operated during the war by American President Lines, one of the largest private shipping companies in the world. S. S. Pennant was escorted by USS Patterson (DD-392) to Noumea, New Caledonia arriving on May 13, 1942. Here she is embarking enlisted men of the US Army Air Corps. Later she carried occupation troops to Japan. Note the wooden frame at the top of the photo; this indicates the rough manner in which she was converted to a troopship. Senior personnel would often receive the top bunk, as during a storm the lower bunks would be showered with vomit. The higher bunks would have a greater roll during heavy seas.